Kroll & Ziller - Target Industrial Products, Inc. The Ziller Holding Company was established in 1926 in Hilden Germany, near Dusseldorf by Dr. Hans Ziller. The holding group consists of Nilos Ring, Nilos Belting, Kroll & Ziller Gaskets and Coal Control. Kroll & Ziller flange gaskets are made of elastomer materials with a steel insert. The K & Z Rubber–Steel flange gaskets and adjustable Wedge Rings have been proven in use over many years and in all areas of pipeline construction. Several top steel mills, power plants, petrochemical industries, pharmaceutical industries as well as gas and water companies are long-time users of K & Z’s sealing products. Environmentally Safe Gaskets – approved by independent bodies. Operating Reliability – minimizes daily problems of the maintenance staff and fitters. Standardization – allows for a substantive reduction of variety and inventory. Easy Handling – minimizes daily problems of the maintenance staff and fitters. Cost Effective Logistics – minimizes problems for procurement managers and buyers. G-ST and G-ST-P/S profile flange gaskets made of elastomer materials with steel insert. High efficiency due to reduced operating costs. Ease of installation is attributed to the rigid steel core. The policy of Kroll-Ziller over the last 15 years has been specialization, research and development in close collaboration with a large number of customers. Vulcanization provides an extremely good adhesion between the steel insert and the rubber sheath ensuring separations and blowouts are not possible. Optimum handling during installation due to the rigid steel core. Ring style gasket ensures self centering on the bolt circle. 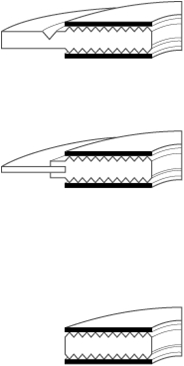 The O – Ring is the most static sealing element. The performance is perfect even without a cost intensive groove. The rigid body of the profile G-ST gaskets absorbs high surface pressures. Offers a degree of operating reliability. Offers advantages like wide sealing surface area and rectangular instead of round cross section near the O-Ring. For various applications best suited for joints connecting non-metallic (plastics, GRP, PVC, PP< PE, PVDF, etc.) and steel flanges. For various applications best suited for partially coated flanges and heavy duty services. Flexible design gasket with visible stainless steel insert. Ideally suited for solving alignment problems during assembly or for filling large gaps in installation. Have a high chemical resistance. Kammprofile gaskets are available in a large number of alloys and soft facing materials. 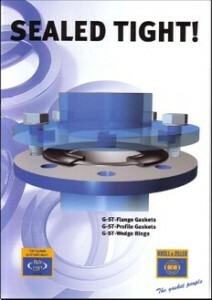 Thrust ring with kammprofile on both sides, graduation 1 mm / .04 inch with fixed centering ring and rated breaking zone. For flanges with flat or raised face. Thrust ring with kammprofile on both sides, graduation 1 mm / .04 inch with loose centering ring. For flanges with flat face. Thrust ring with kammprofile on both sides,graduation 1 mm / .04 inch without centering ring. Usage at high pressure possible. Full utilization of bolt forces recommended. Very good resistance against nearly all kind of media, especially against corrosives. Heavy duty, reinforced and blow-out safe gaskets with high operation reliability. Very low leakage rates with gases and liquids. Fulfills high sealing requirements. No aging and embrittlement even at high temperatures. Asbestos-free, completely harmless to health. Can be reused after re-lamination. Very good handling at transport, installation and deinstallation. Solid state design. No destruction through bolt overload. Marking of each gasket on centering ring. Usage of low chloride graphite layers and adhesive allows usage in systems made of austenitic steel. Are well established in chemical and petrochemical industries; in conventional and nuclear power plants. 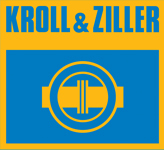 CLICK HERE to download the complete Kroll & Ziller catalog in pdf format. Kroll & Ziller’s G-ST line comes in a variety of materials to suit almost any need. Your Source For Gasket Solutions & More! Copyright © 2019 Target Industrial Products, Inc. All Rights Reserved.